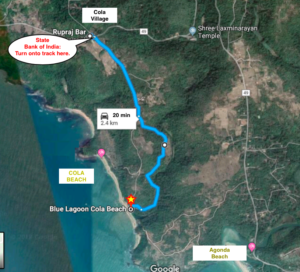 Directions and roadmaps are available below for guests travelling to us from the north (Panjim, Margao) and from the south (Agonda, Palolem, Chaudi). 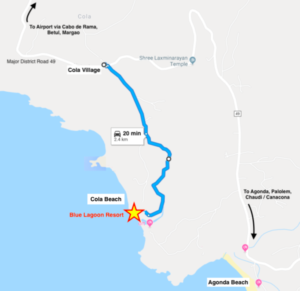 On the maps, follow the blue road until you get to Cola Village. Then take the unsurfaced red road that starts behind the BARODA BANK (formerly, State Bank of India) – this is a bumpy track, about 2.4 km / 1.5 miles long. We will start by describing the track! The last 2.4 km / 1.5 miles to Blue Lagoon is down a very bumpy and uneven dirt track, which is narrow in places. There is a small sign for “Cola Beach” on a lampost where the track starts. The track is marked in red on the maps. There is a car park at the end, above Blue Lagoon Resort. Steps lead down into the resort from there. It can be hard to find the turn for the track in the dark. The track is not lit at night. If you are arriving at night you must tell us in advance so we can help you get here. We have many cars, taxis and two-wheelers who use this track everyday. Whether or not you want to drive on it depends on your confidence and your car. If you do not want to drive down the track we can send a track taxi to meet you at Cola Village. You can park by the main road at the Cola Village Panchayat Office / Baroda Bank and we can arrange a track taxi to the resort (300-500 INR). Let us know if you might need this service so we can coordinate it in advance. 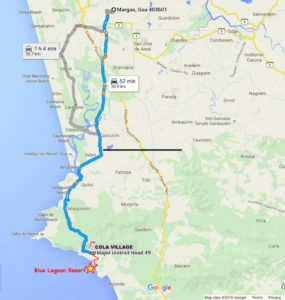 Take the coastal road south via Chinchinim, Betul and Cabo de Rama. 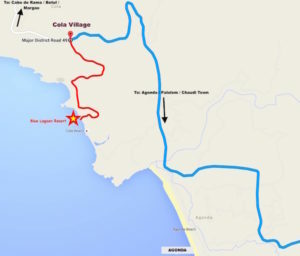 Shortly after Cabo de Rama you will reach Cola Village. Landmarks: look for the Panchayat Office (local government office) and Baroda Bank on your right. Immediately past these, turn right onto the red, unsurfaced track that goes behind the buildings. Take the road from Palolem to Agonda. Do not turn into Agonda – stay on the main road. After Agonda, DO NOT take the track on left marked “Chattai Yoga”… this is the wrong track, although your GPS might tell you to take it. Stay on the main road and keep driving north. 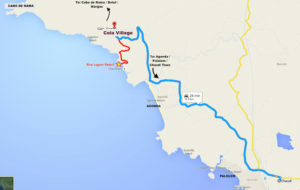 You will reach Cola Village about 15-20 minutes / 10km after Agonda. Landmarks: look for the Panchayat Office (local government office) and Baroda Bank on your left. There is a small sign on a post saying “Cola Beach”. This is where the correct track to Blue Lagoon is. Turn left here, onto the red, unsurfaced track. At Cola Village, turn off the main road onto the track that goes behind the Baroda Bank.